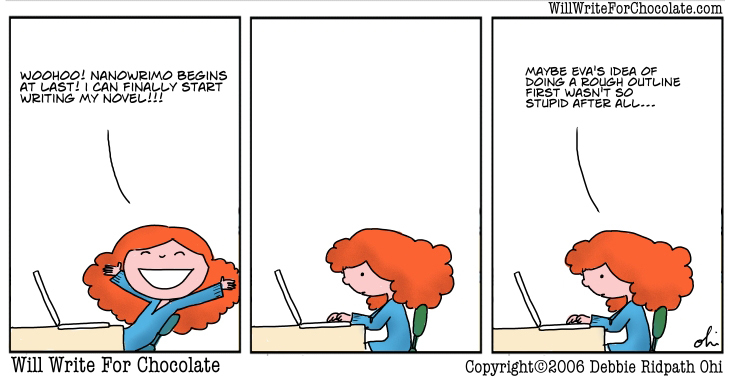 NaNoWriMo is coming whether ready or not. I question where October exactly went, but that happens with age. In the meantime, I’m relatively ready to go. Are You? I have a good high level outline, mainly thanks to a SavvyAuthors.com workshop by Todd Stone, which we’ve been working through over the last few weeks. I added a lot more plotting techniques, and I can’t get a grip of the proper ending, but it will work when I hit the hairy patches. Character-wise, I don’t have that much. I want to wing NaNo a lot more than previously, and free up my writing to see what happens. 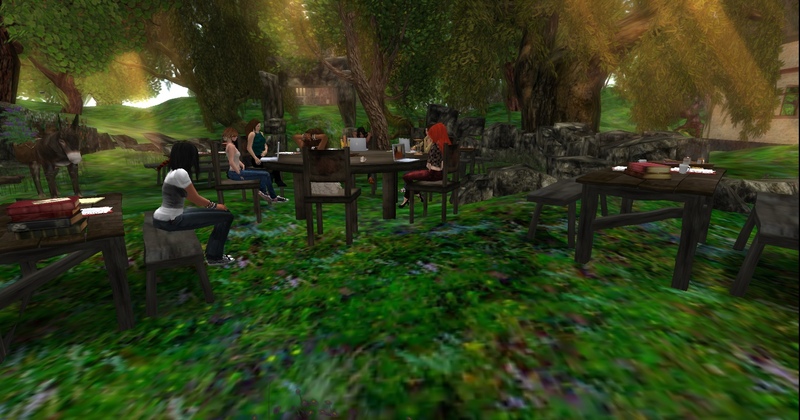 Virtually, on Friday morning my time I went to my first write-in or meeting – Milkwood Writer’s on Second Life held a NaNo Prep meeting with a goody bag etc. Here we are (below) – sharing our first concepts of stories we will be working on. I did notice that avatar-wise, we appear to be all women, however that’s a virtual viewpoint – you never know if there’s not a male behind the virtual skin. That’s me on the left – when I got there all the middle seats were taken, so I sat down in an outer circle. The Milkwood WriMo’s have a daily write-in setup for 1:00pm SLTime. That’s unfortunately 7:00am my next morning, a time when I’m doing breakfast and school runs and things. But I have hopes of making it to several write-in’s virtually over weekends. And will be visiting alone to add my wordcounts up there also. ROW80 Goals – yes, up to date. Yay, me. Which leads me handily to the final NaNo help, thanks to VirtualWriters – this is the blog and organisation that sits overtop of Milkwood, providing twitter and goodreads promotions for writers out of Second Life. At https://hunterswritings.wordpress.com/wp-admin/post.php?post=1237&action=editVirtual Writers there is a page of links for plotting and character prep work for NaNo, including some storyboard pdfs, character charts and archetypes, and plotting sheets. If you haven’t as yet got much underway for your own NaNo novel, perhaps visiting here will help you out. Other NaNo prep help can be found in recent posts – Janice Hardy – Planning your Novel’s Ending; Gina Rossi – Tips from a NaNo Survivor; Roz Morris – Checklist for Outlining your Story for NaNo; James Scott Bell – How to Write a Novel in a Month; Karen Wiesner – How to Write a First Draft in 30 Days; Alexandra Sokolof – series of NaNo Prep posts; Larry Brooks – NaNo index or lookup the NaNo prep hashtag on twitter for more tips – the obvious hash is #nanoprep. P2PU has a NaNo Prep course going on – this is free to join and contribute to. Although I posted up a slightly derisive post on my feelings around NaNo this year myself, I would issue a recommendation that everyone reading this also read the Catherine, Caffienated post on NaNo snobbery. I may not believe that NaNo is a great concept for some people, but when met with commitment and goals that sit over top of real life getting in the way (save for dire circumstances), NaNo for me is the way to go. If you’re after some pretty coloured wordcount spreadsheets, there are several available at Svenja Liv. Svenja Liv also hosts a wordcount button or wordmeter which you can choose the colour and size for. Another wordcount meter at AllFreelance Writing – you can change the size on this one. David Gale has the free Writetrack that allows you to adjust your writing goals through each day or period. Do a search and you will find plenty of other wordcount meters, buttons, and marathon spreadsheets or report cards to work with, many shared through the NaNoWriMo website and forums also. Virtual Writers World PreNaNo page. Karen Wiesner – How to Write a First Draft in 30 Days. Alexandra Sokolof – series of NaNo Prep posts. Catherine, Caffienated post on NaNo snobbery. Update: corrected the incorrect credit for Roz Morris’ checklist. Sorry for that one. Good luck with NaNo. I attempted it over the summer, and it did not go well. If I do it next year, I’ll start preparing well in advance. I like that all of you have built a community around it. Hi! Great resources in this post and I love the idea of joining an organised write-in. Can I just point out a teensy mistake? The post you attributed to Roni Loren is by me. Thanks for letting me know, Roz. I’ve left your comment in and corrected the error in the text content. Must try harder next time.